that officially is called Chocolate Cherry Pecan Chocolate Bread in which I forgot to add the chocolate and substituted walnuts for pecans! But… you can find the original recipe here on their website! There are in fact two recipes for the same bread, the one on the blog is slightly different from the one on their website, I used the one on the blog. Handy step by step pics; isn’t that easy? Almost as easy as it was to make this bread, no knead so I feared a gummy inside but no, not at all! I handled the wet and sticky dough as if it were a sweet soda bread and patted the dough in shape. This got me not as much ovensprings as I hoped for and thus a slightly tighter crumb but on the whole we like this very much. A pleasantly firm crust and really nice the next day toasted. 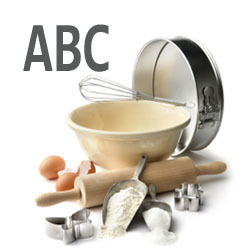 Don't forget to check out the other ABC bakers' No-Knead Bread. and you had time to make this one as well!!! Superwoman. It's a shame that you forgot the chocolate, that went just so well with the cherries (yes I accidentally walked into these cherries from the Lidl a while back). I really didn't remember that there needed to be chocolate in the bread, only saw it when I looked up the recipe again haha. Yep, cherries from Lidl in the pantry as well here!! I can't imagine chocolate in this - especially sweetened chocolate. That would make it cake not bread. Not to mention that cherries and walnuts already seem like the perfect combination. Even though I've made "no-knead" bread, I'm still suspicious of it and I always say in my mind (and sometimes out loud to the cat) "No kneading? That can't be right! But I LIKE kneading!" The long fermentation that no-knead breads go through is just a different way to work the dough, i.e. let it develop itself. I wondered, too, how chocolate in combination with cherries and nuts would be in a bread, but it tasted really good. Though Elizabeth is right, this is more a kind of dessert bread, nothing you would make a sandwich with. I think the chocolate is the one thing you could leave off, cherries and nuts alone would have tasted just fine, too. Thank you Hanaa! I did make it in time but -as almost always- forgot to publish in time! I didn't miss the chocolate but then again, I don't really like chocolate with fruit so..
Yours looks great! I think toasted pecans would be just perfect. I made mine with chocolate, but it's less practical that way. Next time I'll try it that way. Chocolate would have been nice but I usually go for walnuts over pecans. It's beautiful bread with or without chocolate.